Faces of Valor – Raising money to provide scholarships and financial assistance to our military, police, and firefighters. Faces of Valor USA is a nonprofit organization raising money to provide scholarships and financial assistance to those injured, or to children of those killed in the performance of their duty. Join our annual Picnic fundraiser. It’s an AWESOME CAUSE! While on patrol on April 24, 2011, USMC Corporal Clark Cavalier, was catastrophically injured when he stepped on an improvised explosive device in the Marja Province of Afghanistan. Corporal Cavalier lost both his legs above the knee and suffered a serious injury to his left arm and hand. 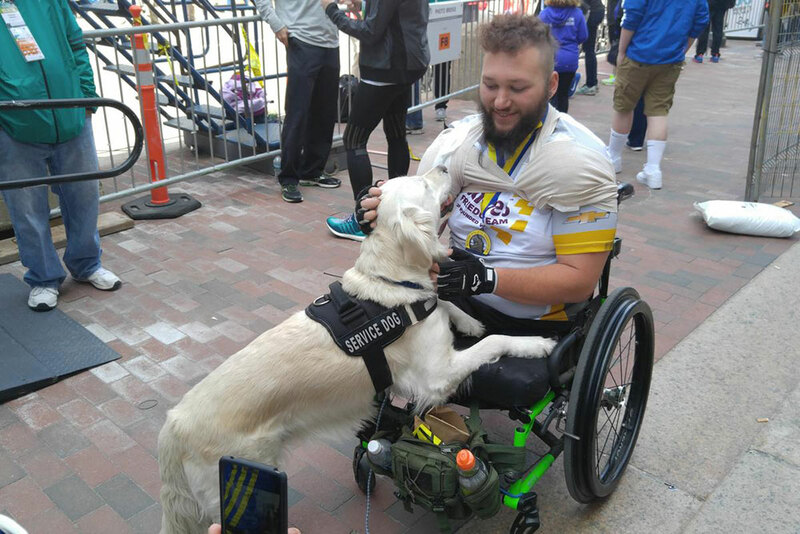 HAPPY GREETING: USMC Corporal Clark Cavalier, 25, of Marydel Maryland, with his service dog, Josie, after finishing the Boston Marathon. The former Marine bonded with marathon bombing survivors while rehabbing. Now it is time for all of us to show our support for USMC Corporal Clark Cavalier. Please help Faces of Valor USA honor them.